A special shout-out to all Wildlife Lovers out there! 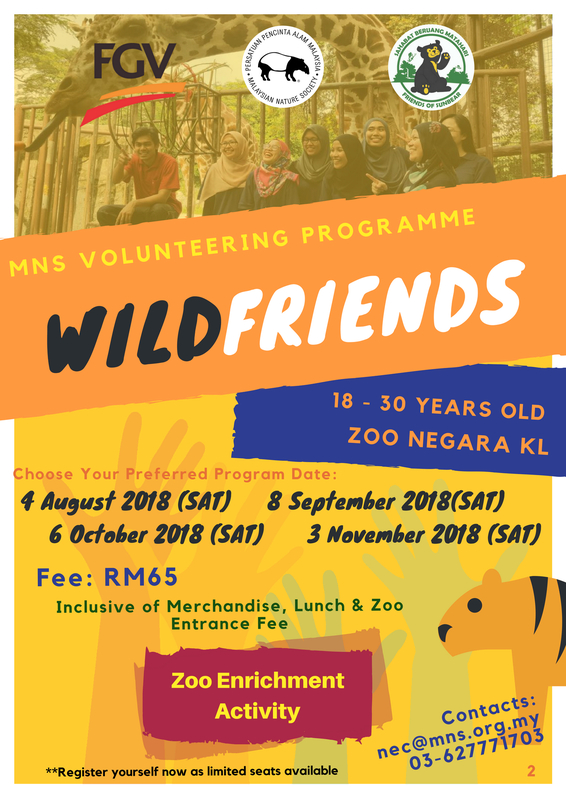 MNS WILDFRIENDS a special volunteer program arranged by MNS for all youths is now open for registration. We are bringing you a total of 4 programs on selected Saturdays from August to November 2018. As you get up close and personal with the animals, do not miss this opportunity to participate in the Explore Race and other enrichment activities specially arranged for all our participants. *The fee is inclusive of zoo entrance, lunch,certificates for all participants. Kindly note that transportation to and fro the venue is not provided. Register now at https://goo.gl/forms/ZNLUEQ5WJbHvqbZF2 .Hurry up and register now as only limited seats are available. Registration closes on 5 working days before the each session. Click https://bit.ly/2MEPpY3 to read about the fun experienced by our previous participants.